FAT LOSS AND PHYSIQUE IMPROVEMENT: Males or females that wish to burn much more body fat by taking caffeine just before aerobic activity. Taking before a weight training workout enhances the intensity of training whilst reducing perceived effort. This enhanced training capacity results in more fat being burnt, and more muscle being developed. PERFORMANCE IMPROVEMENT: CAFFEINE ADVANTAGES FOR THE COMPETITOR: Competitors desiring to enhance their performance can easily use up to 6mg / kilo of bodyweight and experience performance enhancing results without going over the 'legal limit'. 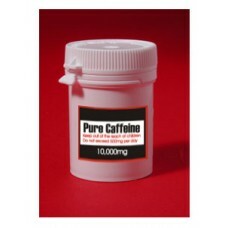 Caffeine is a preferred performance enhancer amongst cyclists. Ironpower Caffeine comes with a green measuring scoop which holds 250mg when level (flat). To enhance performance, take between 250mg - 500mg half an hour prior to the exercise event. Take 1/2 an hour before working out with weights. Take 3 hrs just before aerobic work to optimize fat burning. OTHER USES: Boosts muscle fiber recruitment and intensity of muscular contraction, acts as a diuretic, bronchodilator (aids breathing), and mental stimulant. Copyright © 2019. BuyCaffeine.net. All Rights Reserved.